Piano and chemistry each got Moore’s attention early. “I can remember being four or five years old, coming home from church and trying to play the hymns by ear on the piano. 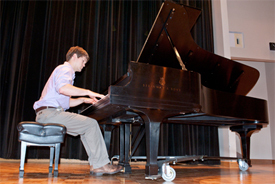 I didn’t actually start taking lessons until I was six.” When he was 14, he began his lessons with Dr. Elaine Harris, UT Martin Department of Music chair. 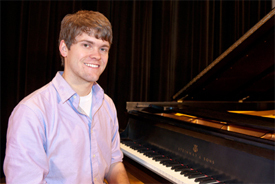 For Moore, that means four to five hours, seven days a week at the piano for practice and rehearsal. 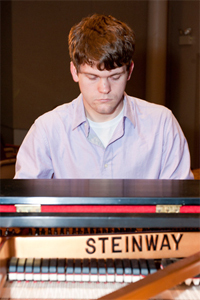 He has been pianist at First United Methodist Church in Martin since October of 2008 and is asked to play about twice a month at other public events. Chemistry had a similar affect. He loved his first chemistry class in high school, and after just a few weeks of chemistry his junior year in high school he knew that was going to be his major in college. “I chose UT Martin mainly because of my acceptance into the University Scholars Program and its high acceptance rate for medical school applicants,” he said. Moore said his major combination has presented many challenges. “Music requires a considerable time commitment with practice, rehearsals, performances, concert attendance and classes. “I’ve definitely had some ‘Why did I do this? moments’ when things get really hectic. It has required some serious time-management skills,” he said, “but I am so glad that I chose to do both. Chemistry calls for heavy critical-thinking skills, and music allows for expression and creativity. They really balance each other out.” So much so that he thinks he would feel as though he was missing something if he had to choose just one of them. UT Martin, he said, was a good choice for him, since not all schools will allow a student to double major in two completely unrelated areas. He has rounded out his experience at UT Martin via the University Scholars Program, working with his faculty mentor on the international geology project and other activities.